Mix 1/2 cup sugar, the cornstarch and cinnamon in medium bowl. Add apples; toss gently. Spoon apple mixture onto center of crust, spreading to within 2 inches of edge. 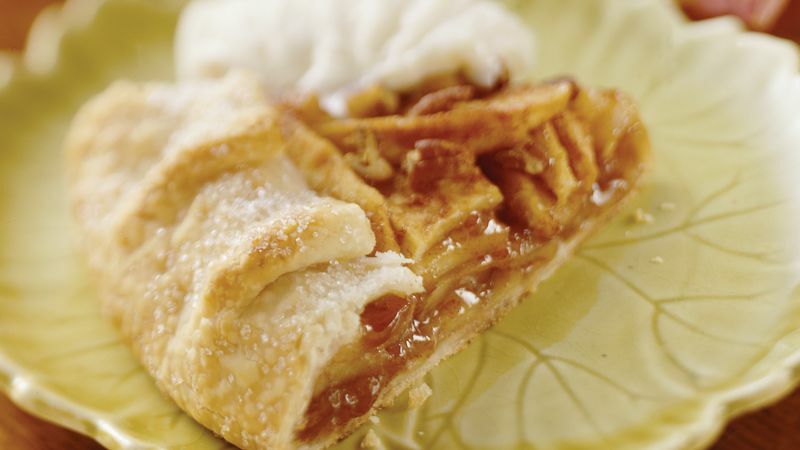 Fold edge of crust over apples, ruffling decoratively. Brush edge of crust with water. Sprinkle with 1 teaspoon sugar. Bake 15 minutes or until crust is golden brown. Sprinkle pecans over apple mixture. Bake 5 to 15 minutes longer or until apples are tender. A sprinkling of sugar before baking gives the crust a sparkly and sweet finish. Try using coarse sugar (available in the supermarket baking aisle) instead of granulated sugar for an extra-­special sugar twinkle.